Ooh, this is a fun puzzle. We’ve got SMARTYPANTS, “MADE YOU LOOK,” and ORDER ONLINE stacked together. There’s a little EDGINESS. A CONGA line on your BIRTHDAY. A pair of OVARIES instead of the standard crossword OVA. Some ZYDECO music. “LIVE A LITTLE!” Maybe at the IVY LEAGUE. Uh-oh, our Ivy Leaguer has PASSED OUT. 58a. [It has many cells], SPREADSHEET. Even with SPREAD in place, I was drawing a blank here. And I use spreadsheets every dang day! 30d. [Lions, Tigers and Bears play in it], IVY LEAGUE. I ignored the Tigers and immediately thought of the NFC North. Oh, my. 31d. [Cold remedies? ], RADIATORS. Springtime is that awkward, in-between season when it’s not quite cold enough for the radiators to kick in, but not warm enough for me to stop craving the heat. 42d. [Bad things to find in theories], HOLES. Wait! What if the theory is about black holes? You want to have the black holes there. 50d. [Bass parts], FINS. Unlike its neighbor PITCH, this “bass” isn’t about the singing voice. 40a. [Trickery], WILES. 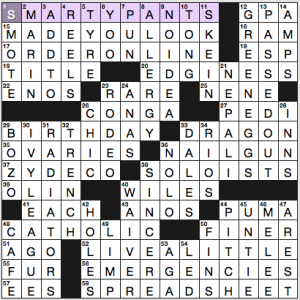 Hey, look, the clue’s not gendered. I appreciate that. The cluing was either easy or pitched right to me, because this was a speedy solve. That means I barely noticed the clunkier bits of short fill—ENOS NENE ANOS ANAS EES YOO AGA. 4.25 stars from me. I had fun with this one. Good morning, everyone! I hope you’re all doing well. Today’s crossword puzzle was brought to us by Mr. Brad Wilber, and it definitely made some waves. All four of the theme answers are all things that, in its own way, makes/creates waves of different sorts. HOME PERMANENT (20A: [Origin of some waves]) – Hair products! Nice! FUNHOUSE MIRROR (39A: [Origin of some waves]) – Have never been inside of a funhouse. I never want to be inside of a funhouse! I’m a killjoy, I know. This grid, given most puzzles on CrosSynergy, was definitely worth its Friday slot, as there was much tougher cluing today for the entries, which I’m sure many of you appreciated. Not sure if Brad meant to have the homophones AIR (28A: [Run on television]) and ERR on the same line, but noticing that was pretty cute (29A: [Blunder]). Absolutely loved seeing the alternate usage/definition of FENCE in its clue (57A: [Dealer in stolen goods]), and that didn’t trip me up at all once I put the “F” in from FAR (57D: [Wide’s partner]). How about the love for Bennett CERF in the grid, he of “What’s My Line?” game show fame (56D: [American publisher who championed Joyce’s “Ulysses”]). I’m not up on my Rodgers and Hammerstein, though, so LIESL, however elegant-looking it is in this grid (and it’s very elegant-looking), was a very tough one for me to get (16A: [Rolf’s duet partner in “Sixteen Going on Seventeen”]). Had the “S” and the “L” pretty quickly and immediately though I had screwed up. It would have been amazing if it was spelled “Liesel,” as I could have saved the entry to talk about Australian Olympic gold medal-winning swimmer Liesel Jones. So, I’ll just have to find another clue. Ah, found one! “Sports will make you smarter” moment of the day: TRUMP (3D: [Subject of many strips in the “Bloom County” reboot]) – There was a time when Donald TRUMP owned a professional sports franchise…and helped run the league the franchise was a part of into extinction. In 1983, Trump bought the New Jersey Generals of the United States Football League (USFL), and the league was initially successful in being an alternative to the National Football League. The league played its games in the spring (as opposed to the fall, when the NFL played its games), had TV contracts with ABC and ESPN, and managed to lure a host of marquee players, including Heisman Trophy winners Herschel Walker and Doug Flutue – both of whom played for the Generals – as well as future Hall of Fame quarterbacks Steve Young and Jim Kelly. Though a merger between the NFL and USFL seemed likely to many, Trump, however, convinced the other owners in the league to try and hold the season in the fall – in direct competition with the NFL. Big mistake! The league, spurred by Trump, eventually took the NFL to court in an antitrust lawsuit, hoping for a big settlement and/or to merge with the NFL. The USFL won the case, but won a grand total of $3. After the 1985 season, the USFL folded, and Trump’s bravado and/or recklessness is widely seen as the catalyst for the league’s demise. Thank you all for your time, and I’ll see you tomorrow! Have a great weekend! Today’s letter addition theme earns most of its points for the details in the execution. The revealer is STICKEMUP, and four long downs have EM added to their beginnings. The results were kind of ho-hum for me. There is one slight (irrelevant?) inconsistency in the IRS to EMIRS is a much more radical change than what happens to the rest when EM is added. More for the EMBARKINGDOG mini-theme… [Visiting the vet, maybe], INACAGE and (reaching, by the cluer) [How pooches’ smooches are delivered], DAMPLY (I think WETLY is more canon…) While I’m here, PSA, put cats in cat carriers when bringing to the vet. When telling people to do this on a local page, I have been accused of encouraging people to torture their cats. A mildly inconvenienced cat is far better than one that has wriggled out of your arms into a waiting room full of dogs / out of the door into the busy street etc. And yes, most practices are happy to lend you one if you don’t have. Mystery answers: [___ work: menial labor], SCUT. I’ve been taught SCUT = rabbit tail. Who moved the football? [Hair care brand since 1930], BRECK – if this available here, I am oblivious to it. A little dry, but not a puzzle I disagree with. This entry was posted in Daily Puzzles and tagged Brad Wilber, Jeffrey Wechsler, Robyn Weintraub. Bookmark the permalink. NYT: Fun and done in Monday speed! Seriously. Made me feel like such a SMARTYPANTS! The puzzle had me at MARIN… I usually hate county names, I know my own and that’s it. But Marin, now that’s a really great place to know. I’ve loved Sausolito since I was young (i.e. a looong time ago) and we revisited again last month and I still love it. Enjoyed this NYT a lot. I didn’t know there was an Ivy League team called the Lions (it’s Columbia). Reminds me of a bar trivia question I heard once: What is the most common team nickname/mascot in NCAA Division I athletics? Thought that was a pretty good clue. I picked up on it fairly quickly because I have a good friend who is a Princeton (Tigers) grad, and we discuss Ivy League sports from time to time. I have another good friend who is a graduate of NYU. He likes to laugh about their nickname – “Violets” (he calls them the “Fighting Violets,” but I don’t think that’s official). Their mascot however, is a bobcat. Re: bar trivia – seems like I’ve heard “Eagles,” but that might be all colleges, not just D-I. I don’t think I have ever heard Brown referred to as anything other than Brown. I had no idea that its nickname was Bears. I did know Columbia for whatever reason. I also believe it is Eagles as the most common nickname. Exceptionally easy fun puzzle today. I wasn’t crazy about PASSED OUT. Nice, clean fill. It went so quickly, it felt like Wednesday-level cluing. It left me a bit disappointed it wasn’t a harder struggle — and, curiously, simultaneously relieved that it wasn’t a harder struggle. A mild form of cognitive dissonance, I suppose. Jeffery and Rich turned out a terrific puzzle for the LAT. It was both a challenge and pleasure. Good work, you guys! Enjoyed the Brad Wilber CrossSynergy puzzle today – hope we see more of his puzzles. Ade – actually, air and err, strictly speaking, are not homophones. Err (rhymes with fur) has increasingly been mispronounced (to rhyme with fair) to the extent that the more common usage has now been accepted as a variation by many dictionaries. I hate when that happens…… but to urr is human. Thanks, Dave S, for bringing up a pet peeve of mine, regardless of whether our being pedantic ruins a planned joke in a puzzle. It wasn’t a good one. I agree with you! NYT was too easy, which gave me time to do the LAT and CS as well. Nice! Second LAT puzzle in a row that was unsolvable to us in the unwashed segment of society. Even after copying answers from this page I still don’t understand a third of them. I guess nearly ten years in college and a volume of published poetry still doesn’t admit me into the elite group that does these inane concoctions in minutes. 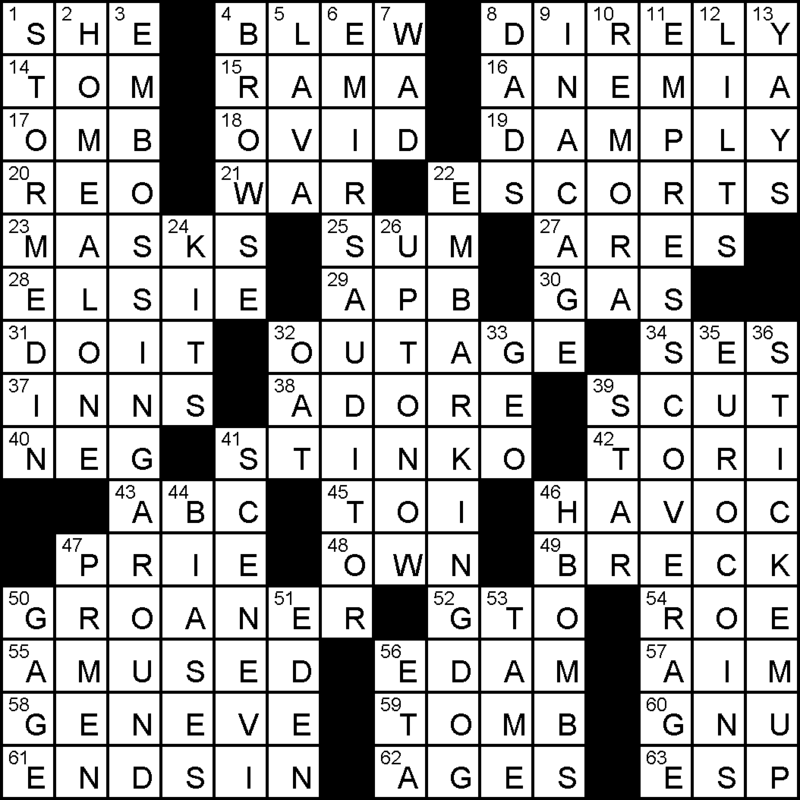 About the only reason for my LAT subscription was the daily puzzle. Time for me to look for another source of intellectual challenge. Signing off for ever! 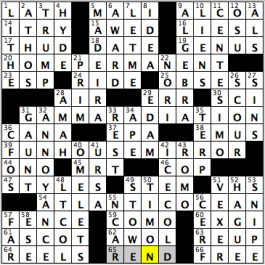 I don’t understand the clue for 34 Across. “Ses” is not a pronoun. It is an adjective. Non? It’s a possessive pronoun. Can mean his, her, their, depending on what it refers to. A pronoun takes the place of a noun. Ses modifies the noun and can mean his or her something, i.e., a possessive adjective.Not their, which would be leur(s), which could be a possessive adjective or pronoun if introduced by le, la or les. Apparently in French, those are called possessive adjectives. Pronouns stand in for nouns, whereas SES stands for “his” (etc.) when used to modify a noun. Gareth, agree totally with your PSA. Another reason is to avoid the damage an angry (claws) or incontinent or hacking cat can do to your car upholstry. I paid extra for that leather! And any moisture will damage cloth upholstry and carpet. Re: the LAT crossword. I struggled with this one, and some of the answers/clues didn’t make sense to me. Can anyone explain what the following answers have to do with the clues? 3 Down: “Lining with raised decorations?”. I get the answer emboss, but where in the clue is there anything about “bossing around”? 11 Down: What is “press coverage”? That sounds like a reporter’s beat, but what does that have to do with insurance? I can see “coverage” standing in for “insurance,” but I don’t see what “press coverage” means in relation to the clue.